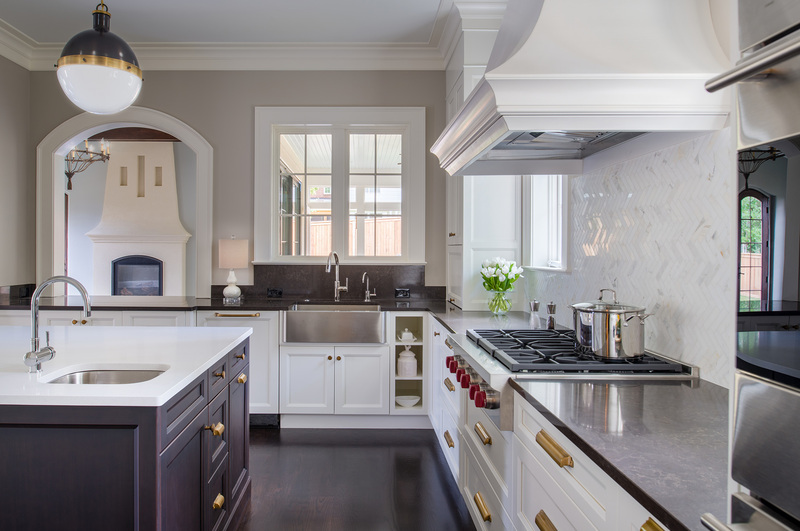 In a contemporary take on a vintage style, this kitchen shows mixed metals done right. Kitchen & Bath Designer Shannon Kadwell, CMKBD, incorporated bronze, brass, chrome and brushed nickel in a French-country inspired design. Over the island, globe pendants pick up on the curves within the arched openings and curved wall corners. 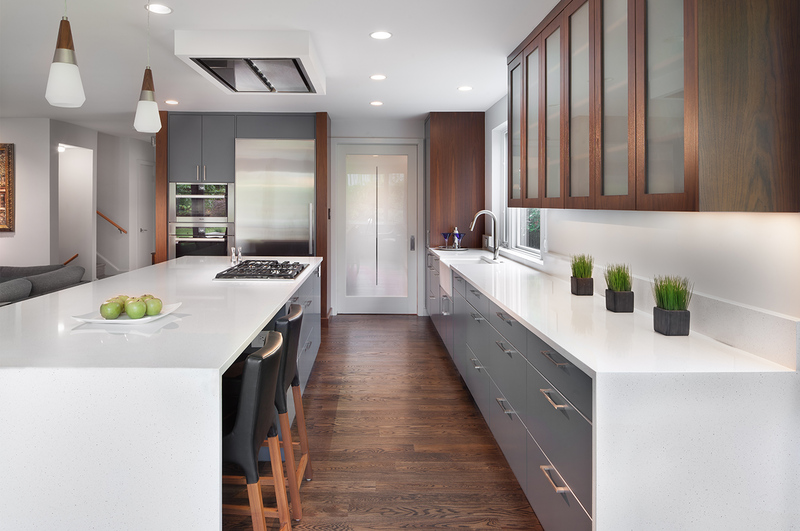 Quartzite countertops – in organic white on the island and a dark color for the perimeter – create contrast and are easy to maintain and very durable. The homeowners wanted to take advantage of their home’s incredible lake views while creating an elegant yet functional kitchen. The focal points: A mirrored backsplash and cabinet faces, which create the illusion that the kitchen is surrounded by the lake. 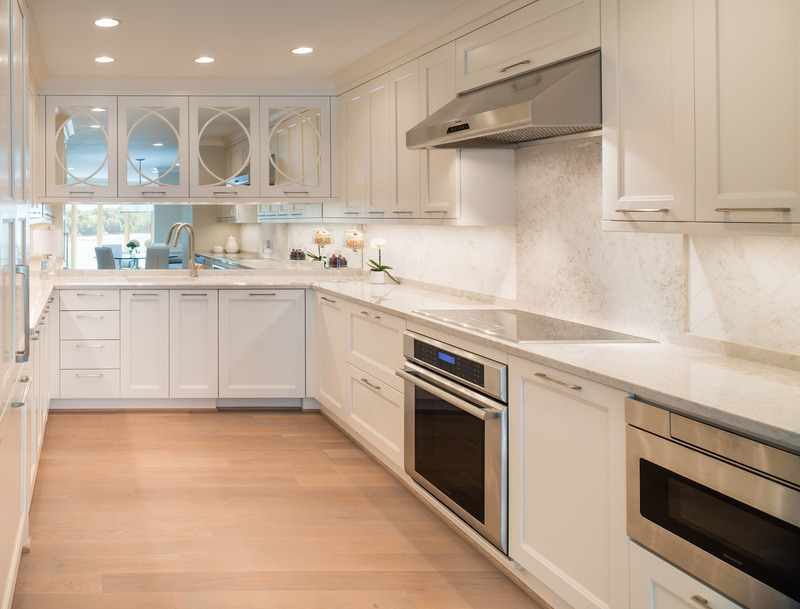 The mirrors, framed by soft, white cabinetry make the kitchen feel larger and reflect sunlight throughout the space. 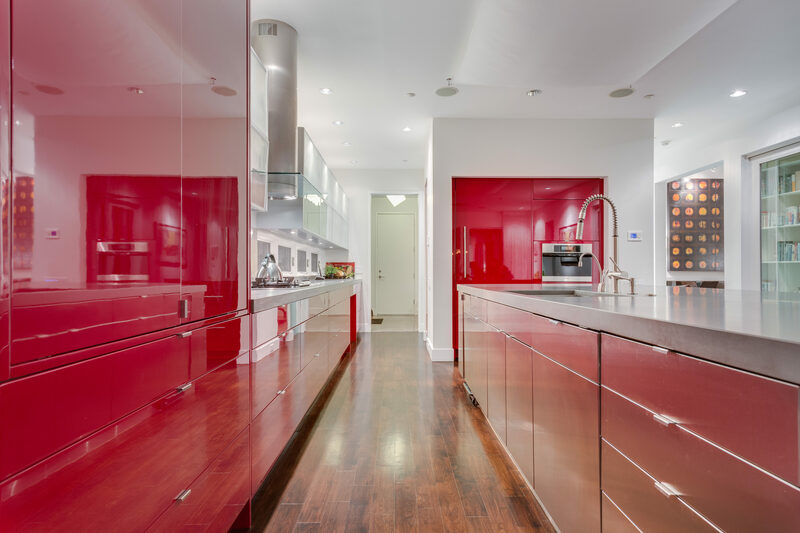 In an otherwise white home, this modern kitchen pops with custom red lacquered kitchen cabinets. This space merges form and function through an uncomplicated and forward-thinking design that realizes the homeowner’s wishes for effective storage and aesthetic harmony. An oversize island was designed for maximum functionality; fashioned out of a concrete block, it offers ample room for work and entertaining. The area-source lighting above the island is fluorescent–but covered by a special drape that diffuses and softens, providing a rich and luminous source of light. Finishing touches include a commercial-grade, telescoping faucet and an extra-deep sink for cleaning up after large parties. 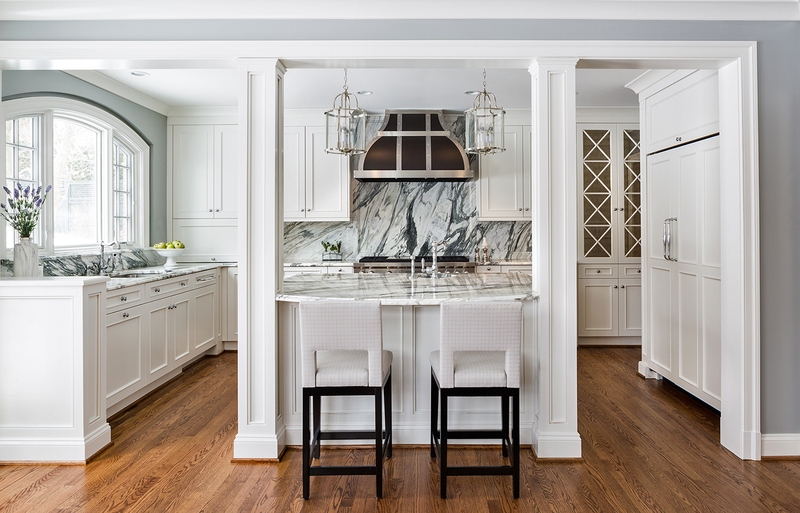 Two pillars and two lantern pendant lights bring the focus to the center of this kitchen where a swirl of black and white marble mimics a drift of smoke. In this kitchen renovation, interior designer Keira St. Claire introduced color by mixing up the cabinet finishes. On top, the cabinets are walnut with frosted glass fronts; below, they are painted in a custom-blend Benjamin Moore steel blue in a satin finish. “By combining color with walnut, we’re nodding to the house’s original mid-century modern era,” St. Claire says. A classic two-toned, accented LaCanche Range was imported from France, and serves as a focal point. The showpiece range can be seen from nearly any room on the first floor. 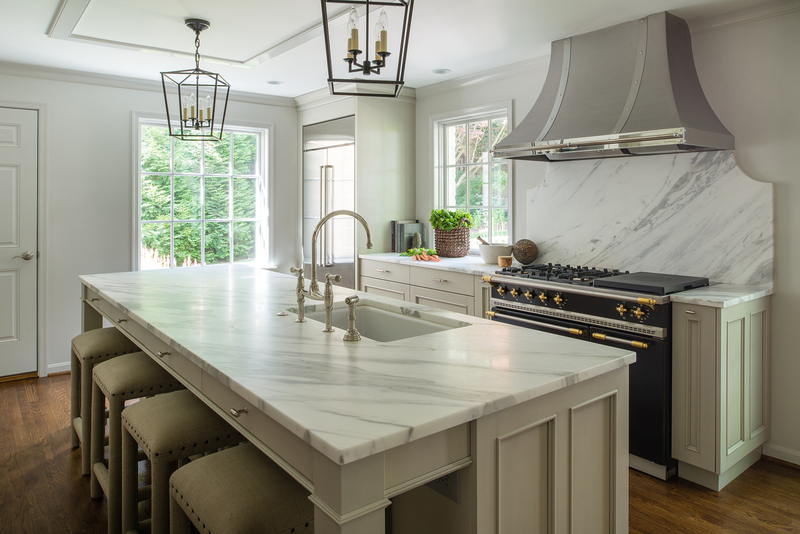 Honed marble countertops are reminiscent of farmhouse kitchens in the valleys of France–the client’s inspiration. Among the various custom storage solutions in the new kitchen, the spacious island has shallow drawers- built under the seating area- making linens convenient to store and use. 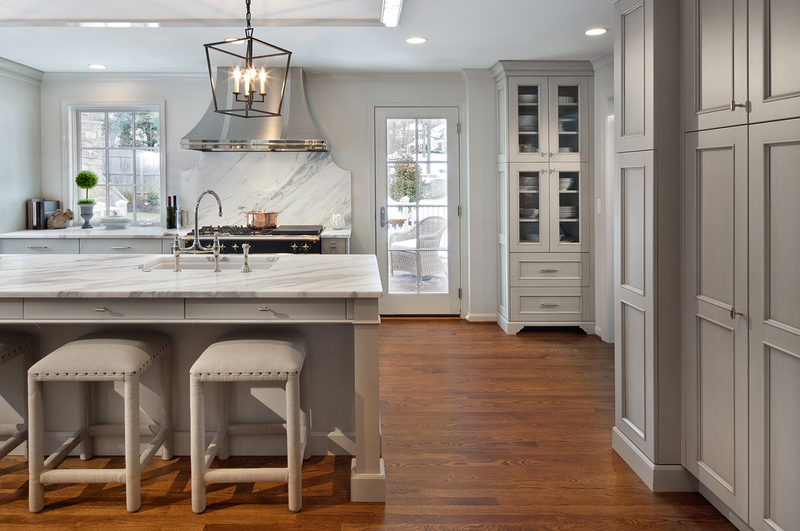 The soft hues of the kitchen flow throughout the house and provide a neutral canvas against which accent pieces shine.